Today, I am grading student papers about Ava Duvernay’s film Selma, Black Lives Matter, and the “Take a Knee” controversy. The sufferings of African Americans were, in my evangelical circles of the late ’70s and early ’80s, a subject for the occasional brow-furrowing. We were more likely to be spurred into action by an invitation to support missionaries in Africa, where our colored “neighbors” would remain far away, their needs something we could address at our convenience rather than something that was knocking on our doors or finding their way into our mostly white neighborhoods and pretty-much all-white churches and schools. The cracking of my own heart’s shell of ignorance and laziness, my slow awakening to my own responsibilities on these matters, is a fairly recent thing and it has only just begun. I’ve begun to see how, in my fear and shame, I was part — am still part — of the force causing the most disruption in God’s order, while the protestors are those bringing evidence of the Kingdom of God. I’m still prone to error and to inaction. So it’s best if I just hand the mic to my superior, my mentor, my teacher. 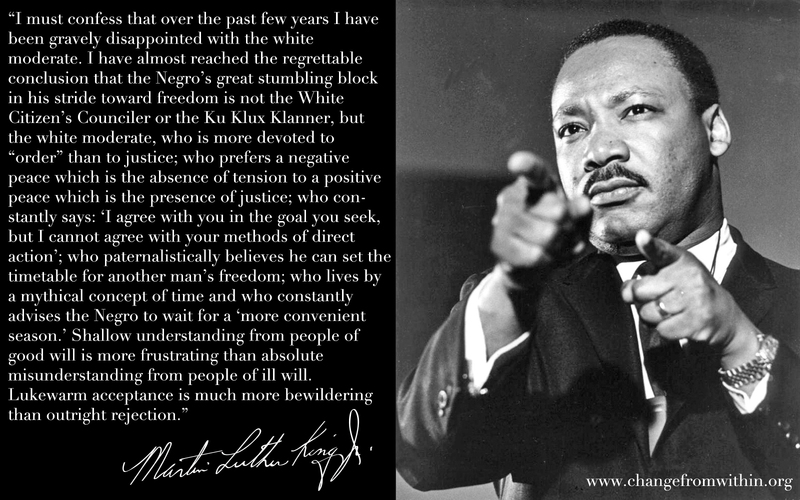 Martin Luther King Jr. saw right through us, and he described our willful ignorance so well here, in Letter from a Birmingham Jail.